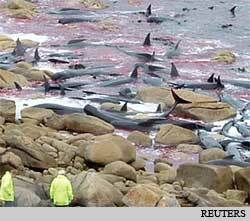 Over 150 whales died end November after beaching themselves in southern Australia, with many thrashing against rocks. Whale beachings occur periodically in Australia and New Zealand for reasons not entirely understood. Theories include disturbance of echolocation due to interference of sound produced by human activities at sea. Twenty-eight babies died in Nigeria after ingesting a teething syrup, tainted with diethylene glycol. The chemical, used as a coolant, triggered kidney failure in the children. The government has recalled the syrup. 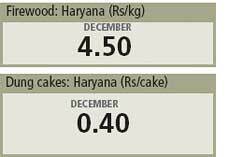 India cut retail prices of petrol and diesel by Rs 5 and Rs 2 a litre on December 5, in response to a sharp fall in global crude oil prices and a slowing economy. Russia signed a key agreement to build four nuclear power plants in India. Following the us and France, it is the third country to sign nuclear deal with India. Beijing met its 2008 target of 256 blue sky days a month ahead as November 30 marked another day of good air quality. 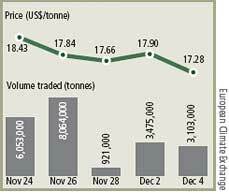 From January to November, major pollutants such as sulphur dioxide and carbon monoxide fell by 27.8 per cent. The city had 246 blue sky days in 2007. Thailand's nine southern provinces were hit by severe downpours, resulting in 21 deaths and affecting 700,000 people since mid-November. Typhoon Nisha killed at least 11 people and affected over 360,000 in nine districts in northern Sri Lanka in the last week of November. Scotland announced a US $15 million prize for the successful demonstration of commercially viable tidal technology in its oceans. The winner has to supply tidal electricity to thousands of houses for two years. Religious leaders from across the world recently held an Interfaith Summit on Climate Change in Sweden. They urged rich nations to reduce their CO2 emissions urgently. The UK approved the Climate Change Bill, which includes the flagship commitment to reduce ghg emissions by 80 per cent below 1990 levels by 2050. Pilot whale meat contains high amounts of mercury, polychlorinated biphenyls and ddt derivatives, and hence should be avoided, said health officers of the Faeroe Islands. Whaling is part of Faeroe tradition. Russia signed a bilateral agreement with Venezuela under which it will build a nuclear power plant in the southern American nation. Peru's archaeologists have found an Inca mummy and 25 ceremonial objects in a dig at Machu Picchu. Brazil declared a state of emergency after large-scale flooding in the southern state of Santa Catarina killed at least 116 people and evacuated about 80,000 people. Fossils of a new flying reptile species were found in Brazil. The fossil suggests that the pterosaur had a five-metre wingspan and is the largest of its kind found yet. Nevado del Huila, a snow-capped volcano, erupted and sparked landslides in southwest Colombia, killing at least 10 people; 12,000 were evacuated. The region is home to Nasa Indians. Uruguay offered its inactive base in the Antarctic to Venezuela. This is likely to allow Venezuela to meet the requirements to join the Antarctic Treaty System as a consultative member. Costa Rica's supreme court annulled a 2004 government decree that had authorized the logging of coastal forests for eco-tourism projects. Mexico's Senate approved a right-to-die law that would allow terminally ill patients to refuse invasive efforts to prolong their lives. The bill does not legalize mercy killing or assisted suicide. Oceans are getting more acidic, 10 times faster than previously thought. Scientists at the University of Chicago in the US said this could harm certain sea animals and reduce the ocean's ability to absorb CO2. New Zealand urged anti-whaling activists not to repeat last season's clashes with Japanese whalers and assured that its air force will track whaling fleet in the Antarctic waters this season. Researchers said a penguin species, the Waitaha, existed in New Zealand 500 years ago. It became extinct after the Polynesians arrived. The finding shows how species respond to human impacts. Seas near the Antarctic peninsula are richer in animal life than the Galapagos islands, dubbed Darwin's lab, scientists claimed. This challenges the notion that tropical areas are richer in species than the poles. 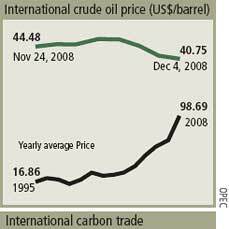 Crude oil price plummeted to US $41.6 a barrel on December 2, 2008, the lowest since February 2005. The drop was amid concerns of global recession and that the oil cartel opec may not reduce its production level.